Point Loma Peninsula, California is an iconic land feature that jets out into the Pacific Ocean and completes the northern rim of the San Diego Bay. The peninsula has been described as “where California began”1, marking the first landing point for European expeditions to present-day California. This moniker is especially fitting, as Point Loma has now become the landing place for the first ever UrbanPond™. 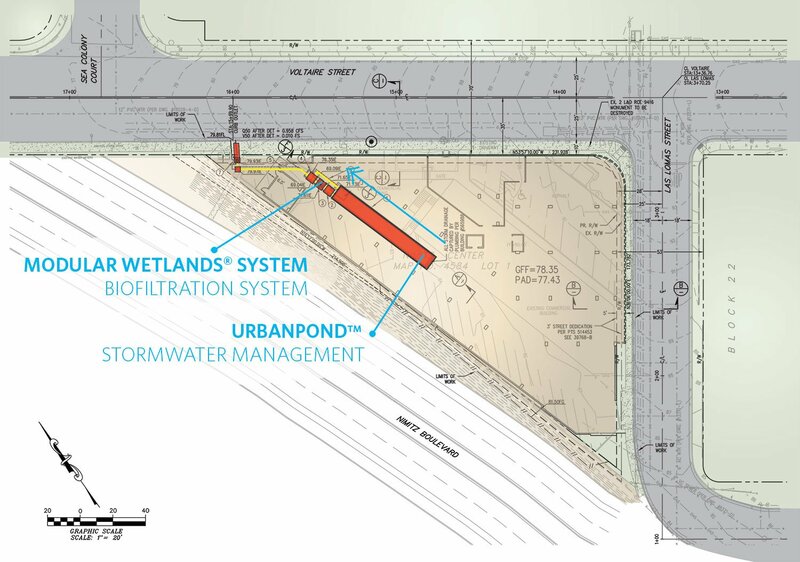 UrbanPond™ is a highly configurable stormwater storage system that is providing developers and engineers access to superior underground capabilities. Within this historical area, as with many other urban retrofits, every possible square foot is sought after, accounted for, and maximized. Development opportunities or replacement projects in Point Loma are rare due to existing developments and topographical challenges. Site re-developments in this trendy area require that the new construction be even more efficient and more creative with land usage in order to maximize opportunities in this region of steep hillsides and oceanfronts. The extreme challenges of the topography require innovative solutions for architects and engineers. Point Plaza Voltaire Apartments located at 3903 Voltaire Street (Voltaire), is a triangular redevelopment site featuring steep grading from the highpoint at the intersection of Voltaire and Las Lomas to the busy Nimitz Boulevard below. 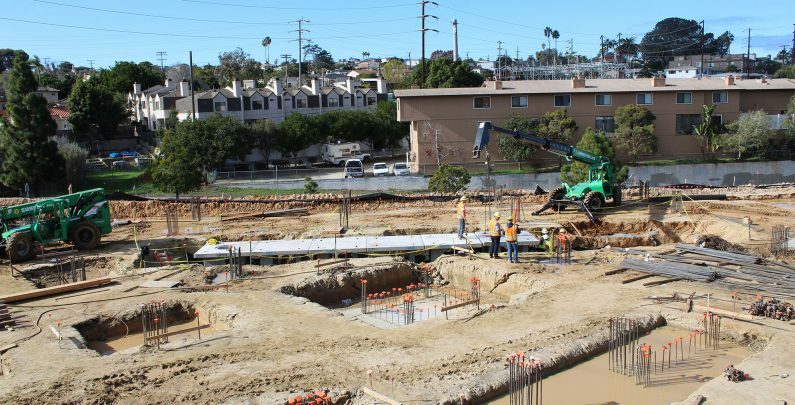 The builder’s goal for Voltaire was to replace an existing commercial building and asphalt parking lot with a state-of-the-art multi-story apartment complex, street-side retail space, and underground parking within a tight trilateral site. To accomplish this, thousands of pounds of earth were excavated and creative architectural plans were developed to maximize on the constrictive shape and dimensions of the space. However, the re-design would increase the imperviousness and density within the Voltaire site for a total drainage area of 24,323 square feet. 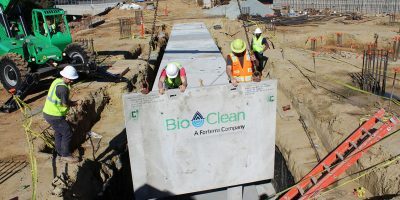 Runoff from the parking area and roof will pick up additional trash, debris, and TSS (total suspended solids), but California regulations require full trash capture while other permits call for bioremediation to promote infiltration. The challenges were adding up for Voltaire, and jeopardizing their ability to reach developer goals. 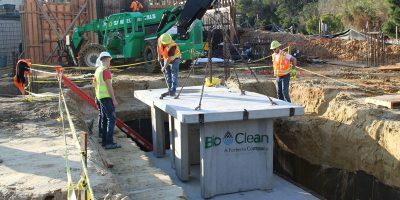 To solve both the storage and treatment needs, Bio Clean Environmental applied a treatment train of proven and compatible systems that address multiple site challenges. 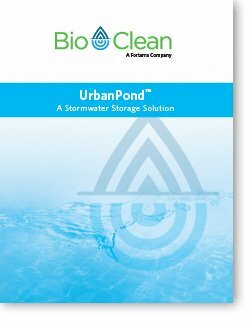 The UrbanPond™ system acts as a storage system to collect all of the site’s stormwater runoff. The modules are 5’ inside height to fit snugly beneath the building’s parking structure. The modules are placed on a concrete foundation slab with multiple holes to promote infiltration and recharge the groundwater table below. Storm flows that outpace the underlying soils infiltration rate are conveyed into a Cleanout/Diversion Structure downstream. An orifice within the Diversion Structure regulates flow into the Modular Wetlands® biofiltration system. The volume-based Modular Wetland (MWS-L-4-4-V) treats 2,200 cubic feet of stormwater with a 33-hour draindown time. Due to this treatment train of structures’ position below the street level, a pump system elevates the treated stormwater to a curb outlet on Voltaire Street. This proven treatment train gives developers and design engineers a reliable go-to solution that no other company can offer. Each product fits within the site footprint, and without these devices the redevelopment could have hit impossible challenges. 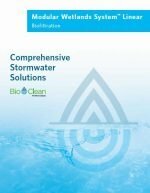 Not only did the UrbanPondTM and Modular Wetlands® stormwater filter combination solve site constraints, but the Modular Wetlands® is the only bioremediation device approved for downstream of detention usage. 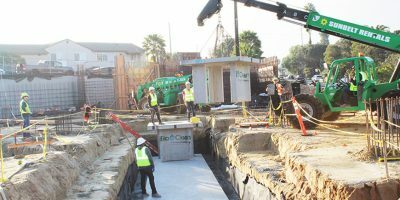 UrbanPond™ is a modular precast concrete underground storage system that mimics the function of ponds and open detention basins and a technological breakthrough in underground stormwater management.